We’ve talked about the nature of the beast. We’ve talked about how to tame the beast. This time, however, we’ll talk about ourselves – mostly, what do we do once we’ve taken control of the impact failure has, and how we use that in the future. This will ensure that not only we succeed instead of fail, but can teach others from our experience. Even harder than admitting your mistakes to yourself is admitting them to others: After all, who wants to be seen as an incompetent judge? In the moment, we can miss the point of the old saying, “No one is born knowing everything,” which reminds us that everyone has already experienced some form of failure, frustration and overcome it. Accepting this makes it much easier to ask for help. One way the Judge Program is structured to allow Judges to support each other and improve is through feedback, and it is absolutely imperative, on our part, to use this system to help us improve. We aren’t alone, and it’s always good for us to be open to meeting, talking, and learning with the other members of our community. It’s clear that the results of our failures are probably still there, and need to be resolved. This doesn’t necessarily mean “go there and resolve them”. In a large event, we are usually all assigned to a specific team, dealing with an experienced Judge, usually a Level 3 or Level 2 with a lot of experience. Knowing that, you should use these lines of help – communicate the problem to your Team Lead as soon as possible. Many problems tend to snowball: they start out small, but get much bigger if ignored. While we are judging, normally, at large events, we have a have a structure that allows us to step aside from the most chaotic parts of the event. Whether it is a complete break, or just a moment in a calmer area, it’s important to recognize our fatigue and recuperate, in order to continue offering the players our level best. A GP is a three-day event; if we exhaust ourselves on the first day, how will we perform on the other days? It’s important to give our best, but in a way that allows us to give our best for the entire event. 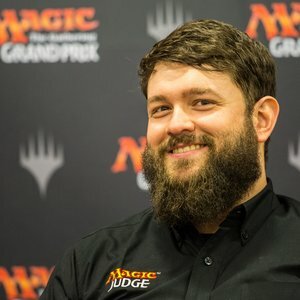 Remember, while we are working with players over the whole event, any interaction of theirs with a Judge could be their only one for the day or weekend. One encounter could define their entire opinion of the judge team. Therefore, we always have to do our best. As we have already said, a mistake is a step in the direction of success. After all, once of decision of ours comes out wrong, it is paramount that we avoid repeating it, and we hope for different results in the future. Once the problem is in hand and under control, it’s important that we once again go over our objective: understanding the logic behind our decisions and the reason we didn’t make the right choice. At the same time, we gain experience, widen our comfort zone, and prepare ourselves for new challenges. Don’t forget: correct, learn, and don’t repeat. As we mentioned before, the Judge Program offers a series of options to help us improve ourselves. To further this goal, we always recommend that Judges have note-taking materials at a tournament, in order to record places they can improve. Mistakes in rules knowledge or tournament operation errors are more linear: once you understand the error, we also understand the source, whether it’s an incorrect interpretation of the rules, an incorrect understanding of our instructions, or just a gap in some area of knowledge. Here, the Judge Program offers support through rules documents, talks, and the ability to ask more experienced judges for help; discussion topics on JudgeApps or e-mail lists are excellent ways to acquire knowledge in order to avoid repeating these errors. Problems with inappropriate conduct, (e.g., my case above) are harder to resolve, if someone’s conduct at an event is a result of their personality or temperament. These are also harder to identify, as well, because our first thought is that we are acting in a way we think is right, and we only realize something is wrong when we cause, and discover we have caused, discomfort to someone. Feedback is the best way for us to know the results of our actions. As a result, whenever we work on a team, we always have to ask to feedback from the judges who we work with, in order for the impressions we make upon others to become clear. In the same way, we should always offer feedback in a constructive way. By proactively seeking feedback, we guarantee that we always have an opportunity to learn and improve ourselves. One thing that should always be clear – while it’s impossible to for us to be perfect all the time, failures shouldn’t be taken lightly. In a tournament environment, with large numbers of people, it’s a place where, when we make an error, we might ruin someone’s day. Because of that, study and materials available in the Judge community are incredibly value. A judge who stays current on documents and weird interactions in the format is taking steps in the direction of success. The fear of mistakes is the most powerful force keeping a judge from doing anything. Yes, we can leave our comfort zone, facing things we have never seen first-hand. If we are nervous, we end up afraid to take a step up and fail. At the end of the day, though, not to act is a mistake. On a judge team at an event, it;s important for us to do our jobs; after all, if we weren’t capable, we wouldn’t be there at all. Being at a large event, on a team with judges who have all been selected for their roles, means a lot for those of us who are selected. As a result, if we ever lose our way, even for a moment, it’s important that we not forget this one very important idea. We have skills. We have knowledge. We have experience. Everyone makes mistakes sometimes, and will make mistakes again. Many thanks to all who all who contributed with feedback and suggestions.